Dr. Richard Burke recently fulfilled a longtime ambition of spending a semester living and teaching overseas. He has combined his interests in travel and teaching numerous times since he joined the University of Lynchburg faculty in 1985, but none of his previous excursions extended more than a few weeks. In 2017, he received a competitive Fulbright fellowship that allowed him to teach in Kazakhstan for about four months. He will share that experience with the campus community on Wednesday, February 14, at 3:30 p.m. in the Daura Gallery. 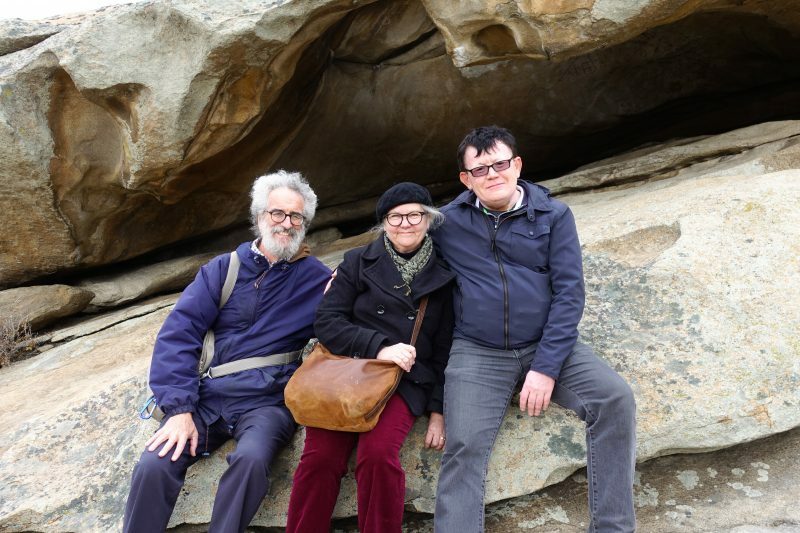 Dr. Burke, his wife, Beth Packert, and Serik Abilov, a professor from Kazakh-American Free University, pause during a hike to see petroglyphs in Kazakhstan. “I wanted to really immerse myself in a different culture, not because I thought it would make me a better person or transform my life in some profound way, but because I thought it would be very interesting to see how people do things differently on a day-to-day basis,” Dr. Burke said in a recent interview. He spent the fall 2017 semester at Kazakh-American Free University in Ust-Kamenogorsk, a city of about 300,000 people in the eastern region of the former Soviet country. The city features a robust public transportation system and walkable sidewalks, Dr. Burke said. He lived about a mile from the university and walked to campus each day. In addition to teaching his own classes, Dr. Burke accepted frequent invitations to visit other classes so more students could practice their English with a native speaker. He also gave more than 25 lectures and presentations to audiences that included high school students, schoolteachers, and other people who wanted to improve their English. Dr. Burke taught classes on American and British literature and literary analysis. He found that his students were already familiar with some of the material — many of them had read “Jane Eyre” in Russian — but some aspects of interpreting literature were new to them. 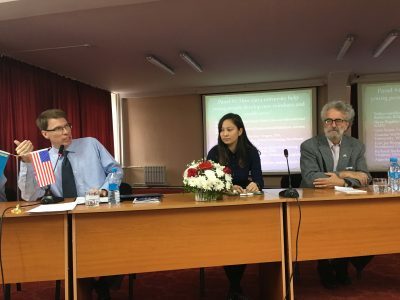 One of Dr. Burke’s first experiences in Kazakhstan was to speak in a forum about how universities can help students develop mindsets beneficial to themselves and their country well. Students in Kazakhstan had been taught to approach literary analysis with a mindset of one correct, quantifiable answer. They were accustomed to counting metaphors and choosing exact meanings of them. Under Dr. Burke, they had an experience much more like what students at Lynchburg enjoy in his classes — interpreting, drawing connections, testing different opinions. Although teaching and making presentations kept him busy, Dr. Burke did make some time to explore the countryside. A traditionally nomadic country, Kazakhstan features large regions with pristine, unsettled environments. Dr. Burke especially enjoyed seeing petroglyphs in a rock wall that were carved 4,000 years ago. Dr. Burke is enjoying his return to the University of Lynchburg campus, where he is teaching courses on composition, children’s literature, the Romantic Period, and the capstone course for English majors this semester. Among other things, he enjoys not having to think so carefully about the words and idioms he uses, not all of which were well known in Kazakhstan.